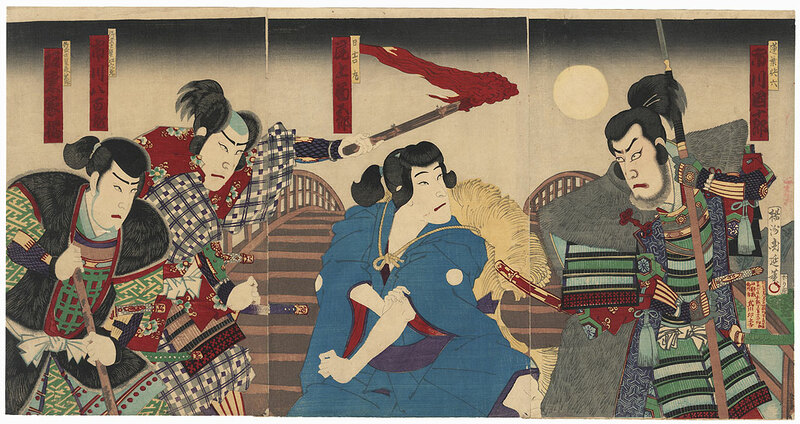 Comments - Great kabuki scene from the life of the great Toyotomi Hideyoshi, who is regarded as Japan's second great unifier. As a child, Hiyoshimaru (the childhood name of Hideyoshi) ran away from an apprenticeship, living as a beggar and sleeping wherever he could find shelter. One night while sleeping on Yahagi Bridge, he was awakened by Hachisuka Koroku and his gang of robbers, who tripped over him in the dark. He is shown here defiantly confronting Koroku, demanding an apology for waking him. The boy stares up at him with a haughty frown, a straw mat hanging over his back. 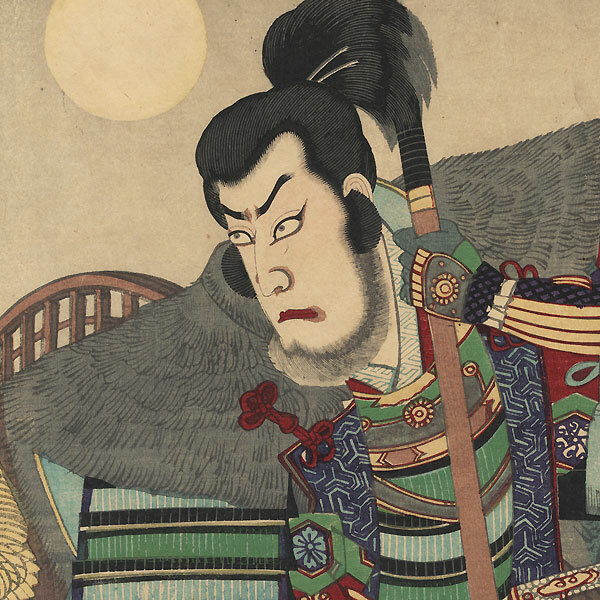 Koroku scowls back at him, wearing a long fur vest over his suit of armor and gripping a spear with both hands. At left, one of his men holds a flaming torching above the child's head, while large full moon glows in the night sky above. 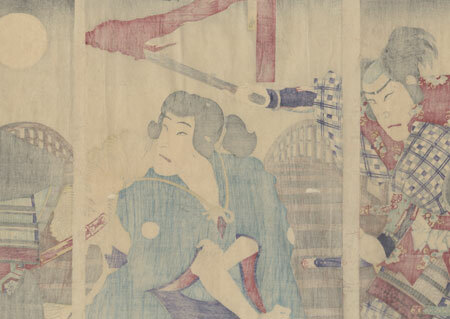 From left, the actors are Bando Kakis I, Ichikawa Yaozo VII, Onoe Kikugoro V, and Ichikawa Danjuro IX. A handsome design with large expressive figures, fine detail in the hair, and bokashi shading in the background. Condition - This print with excellent color and detail as shown. Three attached panels, backed with paper. Vertical folds. A few wormholes and thinning spots, repaired. Slight toning, creasing, and soiling, a few marks. Please see photos for details.